This is the first day I've done in the car since I've had the engine rebuilt, fresh brakes and tyes too! Only problem was the car gained a wicked exhaust leak halfway through the day which meant I was down on power and the car sounded like a tank on the way home. There were a few other mr2's there and I think someone from the forums I've met before with a MKIII but didn't have a chance to find out. Also had a play with another Turbo car with some interesting results, this is my onboard footage. Looks ace fun! Rare to see that many MR2's on one trackday, I think in the 5-6 years I've done trackdays I've come across one MR2, glad to see that some people actually use them properly (Other than the race series). Yeah I was pretty surprised, aside from me and the other guy with the turbo there was a MKII challenge car and a MKIII. Pretty sure the guy with the MKIII was someone from imoc or mr2oc but I didn't get a chance to chat. 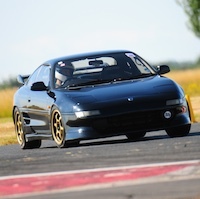 Funny though I've come across a few other mr2's when I go to trackdays, the last time I was at bedford there was an old chap with a MKI 2zz 6 speed swap. Not sure if other people find this, but when you use carbotechs you go through disk and pads at about the same rate. The pads must be very abrasive. Funny thing is the discs maybe had 4000 miles on them and only one other track day. The pads were pretty much brand new and just bedded in. I have a feeling maybe carbotech changed their pad material or something from the last set I had. Also possibly it might just have been the amount of time the car sat without much use for several months , or I xxxxx up the bedding in process idk. The other guys car was a rev1 or 2, but at that point my car developed a massive exhaust leak around the turbo area so I was down a fair amount of power.